One of a kind Real Rustic Luxury Log Cabin 'Hansel & Gretel' type called Hidden Forest Hideaway!! True, rustic 54 year old log cabin nestled on 1 acre treed lot in Lakeside Summer Homes. Looking in the Pinetop Country Club??? This location is great for a few reasons: 1)convenience and easier access to stores, restaurants, entertainment, only 1 minute to Safeway verses up to 20 minutes each way if in the Club. 2) Walking distance to movies and several restaurants 3) Seclusion on the 1 acre, privacy from neighbors 4) Heavily treed lot. 5) Saves you driving time to get to your destination and avoid the Club traffic! Got a Tesla or other EV? We have a 220V outlet available to get you fully charged in just a few hours. Just bring your own cord. Did you know that Pinetop-Lakeside has 65 lakes and streams? We are only 1 mile from Rainbow Lake, where they offer boat rentals, fishing and feeding the ducks. Appx. 30 minutes to Sunrise for skiing, snowboarding, sledding and fun. Addition to the cabin in 2000, offering 1800 square feet. Luxurious and clean! The 2 bedrooms + Loft, 2 full baths and dining room were added featuring hardwood floors/slate. Loft is 3rd bedroom and 1/2 half bath in full sized laundry room. Come enjoy our beautiful patio, Summer or Winter, and take advantage of our corn hole court, ping pong table, and Jacuzzi. Each bedroom has a king sized bed, queen bed plus 2 twins in the loft. Everything is provided and included for your comfort from sheets, full kitchen, use of washer/dryer, towels, blankets, etc. Just bring your toothbrush and feel right at home. One of the few cabins with real log walls and vaulted ceilings, real hardwood and slate floors. Master suite boasts slate dual head walk in shower, wall fountain. Ceiling fan and TVs in bedrooms. Enjoy our beautiful back patio. Outdoor dining available at the picnic table, gazebo with comfortable patio seating and lighting, outdoor TV, gas fire pit, Jacuzzi, corn hole court, ping pong table, bocce ball, plus two comfortable chairs on the covered front porch. We've also have a RecTec wood pellet grill great for slow cooking different types of meats (pulled pork, brisket, turkey) and a regular gas grill for hamburgers and steaks. Find your favorite recipe and come try it out! Huge wood burning fireplace, 3 skylights, comfortable and cozy furniture and decor. Free cable and wireless high speed Internet, 50' HDTV with DVR (perfect for watching the big games!) AppleTV, trunk full of 25+ board games, Nintendo 64 system with games and bean bag chairs. Two leather reclining sofas, Library with 50+ books, writing desk. Baby's Amenities for your use include vintage wood high chair, wood rocking chair, Graco playpen and umbrella stroller with canopy sunshade. Less to pack and more for us to offer for your convenience. Some toiletries and condiments included for your convenience. Cozy dining room with coffee bar station (espresso machine), blender, toaster. Dining room table seats 6. Fully loaded kitchen with all dishes, glassware, flatware, pots etc included plus the fun stuff like waffle maker, crock pot, outdoor grill, Krups espresso machine, coffee grinder, microwave, muffin tins, cookie sheets, baking needs, wine and margarita glasses, placemats, cloth napkins, etc. This cabin has a special place in our families heart. We have made many memories and are excited about sharing it with guests like you! I love to talk to our guests, so call any time or feel free to email me. It's a REAL LOG CABIN with the logs exposed inside...not plaster walls, but a true rustic cabin in the woods. When my husband found out that this place was for sale, we called the previous owner, stayed the night, and fell in love. What a dream come true to own such a wonderful cabin. We now enjoy sharing it with people that will cherish it as much as we do! 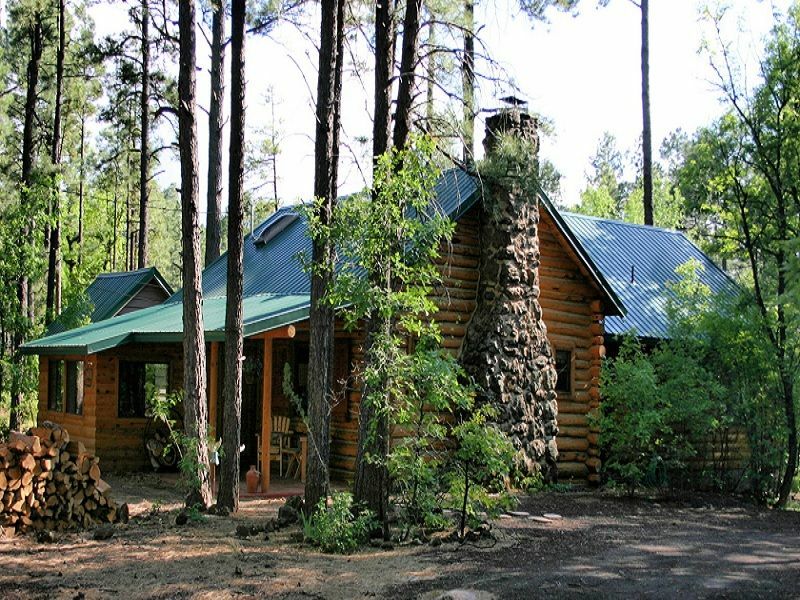 You will benefit from the location, wonderful experience of staying in a clean, cozy cabin with everything there for you. Stress free lodging with all of the comforts of being at home. The outdoor living space is amazing especially during the warmer months but the jacuzzi is year round and feels great after a day of skiing. Games, kitchen & cooking supplies, linens provided and more describe just a few of the many items we have to offer you. COME VISIT THE HIDDEN FOREST HIDEAWAY!!! Not typically needed except for June/July afternoons. We have a portable unit that will be setup for those times. Full sized washer/dryer in the laundry room. Free Wireless Internet, bring your own laptop. Microwave provided. Fully loaded kitchen with all dishes, glassware, flatware, pots etc included plus the fun stuff like waffle maker, crock pot, George Forman grill, outdoor grill, fondue pot, baking needs, etc. 5 TV's including a 50 inch HDTV with DVR and Apple TV in the family room. Each bedroom has a TV along with an outdoor TV in the Gazebo during warmer months. Huge chest of board games available for all ages. Nintendo 64 system with games and two bean bag chairs in the Loft. Front porch with 2 chairs and picnic table. We recently added a 600 sq ft. patio out back w/ a great gazebo and seating area to enjoy! We also have a corn hole court, bocce ball, and gas fire pit. Antique Trunk of Board Games, Library of Books. Perfect cabin with all the essentials and more! My kids and I had a wonderful time playing in the yard, we barely left the cabin area because it was so fun and relaxing! We enjoyed a family game night with all the board games, and loved the outdoor space in the evenings! Overall GREAT experience! Very cozy and perfect for a weekend on the slopes! Awesome place with plenty to do outside & in. Spa was perfect after a long day at Sunrise. Fireplace is beautiful centerpiece in the family room. Kitchen was well stocked and the grill out back was large enough to cook dinner for everyone. It was everything and more! Love the real wood burning fireplace in the living room and the hot tub out back was an added bonus for us after a long day of skiing. No complaints! It was a perfect Christmas! I was recovering from surgery and when we arrived there was a Christmas tree and decorations already up. I got tears in my eyes, it was such a thoughtful touch. We saw deer daily and the cherry on top was the snow. We loved the jacuzzi and the corn hole court as well. EVERYTHING was perfect. We will definitely be back.